At Life’s a Gift we offer students the opportunity to trade in their energy and skills for yoga classes. We are looking for friendly, hard-working and enthusiastic individuals who would be proud to be a representative of the Life’s a Gift community. Our work trades work a set number of hours a week offering services such as administration, cleaning, sales, and miscellaneous other tasks and projects as they crop up week to week. This could include creating signs for the studio, working on the website, or a project of your own creation as a way to share your unique gifts with the community. As positions become available we will post them on this page. If you’re eager to join our team, you can submit an application at any time and we will keep it on file. If you have any questions or comments about the position or the Life’s a Gift work trade program in general, please feel free to contact us. We look forward to reading your application! “Like” us on Facebook and follow Charmaine on Twitter to follow announcements about when trade positions become available. Administration/Sales – Life’s a Gift is looking for a friendly and engaging individual who is confident reaching out to people over the phone in order to update our database as well as sell our services. This trade position includes an incentive bonus. Are you interested in a trade position at Life’s a Gift? Submit a work trade application to us by email. Click here to download our Work Trade Information and Application Form. Why trade energy? 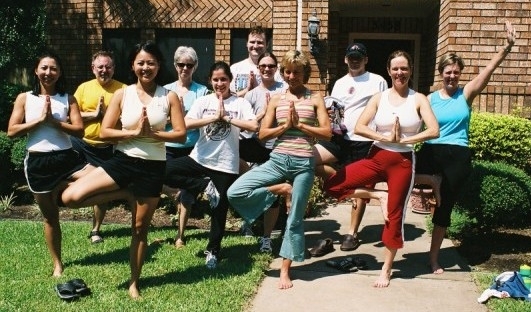 Often people start out doing it for financial reasons, work for yoga, but then stay for the joy of the community. They find a home among like-minded individuals and make new friends.